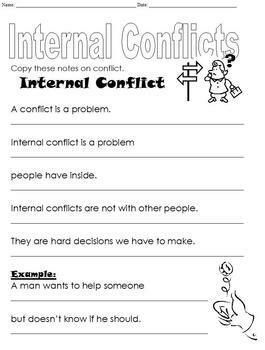 These internal conflict worksheets are modified from the middle school reading curriculum. The first page is a page of notes for students to copy, along with an example of an internal conflict. 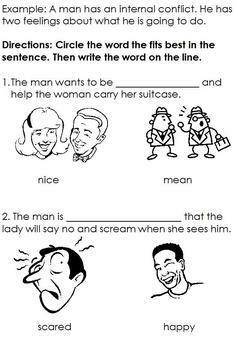 The second page asks two questions and has students circle the correct word/picture from a field of two to answer the question. The pictures are in black and white so students can color when completed. The final page asks students to tie their personal experience into the information. 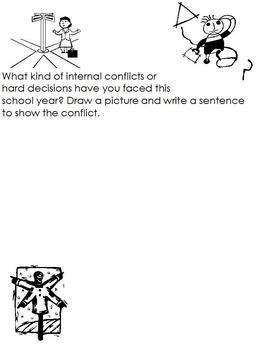 Students are to draw a picture to represent an internal conflict they faced during the school year, accompanied by a sentence or two explaining the conflict. This is excellent for special education students who require an alternate or modified curriculum. It is also an excellent worksheet for general education students in the intermediate grades.